Hi there! My name is Dante. 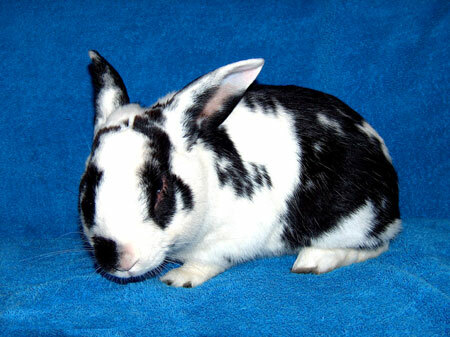 I am a super-handsome, very outgoing and friendly neutered boy. I love to be talked with and I have a great sense of humor. I'm really a fun bunny to be with! I hope you will visit me soon. I am ready to be adopted and loved! I have an old healed injury to my left eye, so I am likely blind in that eye. It doesn't seem to bother me, so I am not really a special needs bunny. But I just thought you might want to know this about me, because I am an honest, down-to-earth, "what you see is what you get" kind of guy. I am named in honor of Dante Kiyoshi Maffeo, newborn son of Ken and Liz Maffeo. Liz is the incredibly talented artist who produced the rabbit artwork seen on our website. Liz and Ken are also the proud "parents" of Gizmo, a mischievous, yet loving mini-rex boy adopted from us a while back. Congratulations Liz and Ken! I just found my forever home with Jane and guess what...? Babette and I are being adopted together!